Summer canal holiday fun with us….. This summer why not take advantage of the great weather 🙂 and enjoy a summer canal holiday…. with the amazing places and adventures they have to offer. From cruising around one of the varied and hugely enjoyable Ring Routes or taking in the breath taking sights of one of our other routes such as the Llangollen Route, with its amazing countryside and must be seen views from the Pontcysyllte Aqueduct, awarded World Heritage site status by Unesco in 2009. We are a family with over 40 years experience of making magical holiday moments which are as exciting, full of adventure and relaxing as you want them to be….. though most importantly….. always completely different from the everyday world! Our boats have one of the best reputations on the canals, read about us on Trip Advisor and see what others say… book a holiday with confidence! In theory, I admit, that does not seem like the recipe for a very exciting holiday. But try a few days aboard a canal boat, and I guarantee you will be hooked. The most familiar of territory takes on a new and intriguing perspective from the water. Nature is all around you: the lush expanses of Cheshire countryside, quizzical cows watching you scud by, birds of prey hovering in pursuit of an unwitting mouse and the herons standing like angle-poise lamps on the bank. There’s history too, in the weathered timbers and clanking metalwork of the locks, and the very knowledge that you are doing pretty much what people were doing two centuries ago, when the canals were the arteries of the Industrial Revolution and hard lives were lived plying these routes in heavy barges dragged by horses. A more luxurious alternative to that life of grim toil awaited us at Andersen Boats in Middlewich: a 69-ft, eight-berth Fjord Emperor, fitted out in oak with two double beds, a shower bathroom, two loos, central heating and a galley with gas cooker and microwave. It’s one of the larger boats in a range which runs from the four-berth 49-ft Fjord Countess to the 70-ft ten-berth Fjord Contessa. 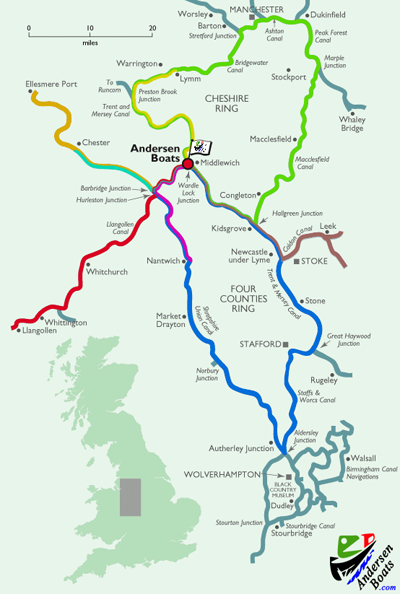 Very many of Andersen’s boats head south westwards to the Llangollen Canal, crossing the Pontcysyllte Aqueduct, one of the most awe-inspiring feats of civil engineering anywhere in the world. But Middlewich can also be a starting point for a trip around the Four Counties Ring – south via the Shropshire Union Canal and back north via the Staffordshire and Worcestershire, then Trent and Mersey canals. Or the Cheshire Ring, taking in Lymm, Manchester, Marple and Macclesfield. You could simply head for Chester – four days of relaxed cruising there and back. After an hour’s basic training from Andersen Boats we were off and what fun it was. We chose to amble aimlessly hither and thither, heading along the Middlewich branch of the Shropshire Union – very soon finding ourselves in unspoilt countryside – and up the Llangollen Canal for a day to overnight at Wrenbury. Here we found the Cotton Arms – everything you’d wish for in a pub, reeking of history and with a hubbub of boaters’ tales being told. We chugged back down the Llangollen to stop at Nantwich, before striking out north towards Chester. By now, the locks held no terrors, not even the Bunbury staircase lock – two locks together, requiring just a little head-scratching before wielding the windlass. Those who are a little daunted by the very idea of navigating locks should know that everything moves very slowly indeed on the canals, the logic of the simpler locks is seldom more perplexing than running a bath, and there is often someone nearby only too eager to help. You soon realise there is a community of canal folk, and the names painted so lovingly on the sides of narrow boats tell you much about the mindset of the owners. ‘It’s Later than You Think’ went one fatalistic legend. ‘G&T Time: Utopia’ said another. One boat summed up the creed of life on the water thus: ‘To Slowly Go’. A healthy portion of that boating community are, undoubtedly, people sufficiently stricken in years that as time seems to go by more quickly, they want to spend it travelling ever more slowly. There is a zen-like combination of calm and concentration to be found manning the tiller at 4mph. But alongside the grey-hairs, we also saw young families on holiday, and an alternative community of full-time boat-dwellers of all ages, their craft often piled high with wood for log-burning stoves. The excellent Great Canal Journeys TV series, featuring Timothy West and Prunella Scales, seems certain to win even more recruits to a holiday on the water. How else is it possible to travel the UK in much the same way, and at much the same pace as our 19th century ancestors did? Unlike a more static holiday, you also get to choose the view from your ‘hotel’ window every night. On our last night, we moored up on at a spot which afforded a lovely vista across the Weaver valley to the village of Church Minshull, and tiptoed down a muddy towpath to seek out another great pub, The Badger Inn. The Cotton Arms, Cholmondeley Road, Wrenbury. Named after the family who lived at Combermere Abbey, parts of the Cotton Arms date back to the 16th century and are thought to have been constructed from ship’s timbers. There was weathered old furniture, a real fire burning and hearty fare like Guinness and steak pie on the menu. The Badger Inn, Cross Lane, Church Minshull. Built in the late 18th century beside the striking St Bartholomew’s Church, The Badger was once a coaching inn and a venue for bare-knuckle fighting! Our only tussle – and very enjoyable it was too – was with a very superior burger and chunky chips while we were ensconsed in the smaller bar beside an open fire one damp evening. The Wild Boar, Whitchurch Road, Tarporley. A short torchlit walk from our mooring point at Beeston brought us to this grand Mock-Tudor pile with its modern European-style brasserie restaurant. Loved the roast lamb rump with twice-baked cheese soufflé, redcurrant and mint gravy. Burland Stores, Wrexham Road, Burland, Nantwich. Good to see a village which still sustains a proper village store, and one offering a friendly welcome and superior Cornish pasties, just a short hop from the towpath. Our conveniently-located base in Middlewich, Cheshire allows a choice of interesting canal narrowboat holiday routes. You can choose totally rural routes or ones involving some very interesting towns and cities. We have chosen a few popular routes to describe in more detail here, and you can see more information about each by clicking on the links below. The descriptions give you some idea of what you will see on each route, how many locks you negotiate and how long they would take to travel. The Llangollen Canal is one of the most popular UK canal holiday routes, with a totally rural backdrop, enlivened by spectacular scenery, amazing aqueducts and the holiday town of Llangollen itself. The Caldon Canal is one of the jewels of the waterways, combined with cruising through the Potteries. The Roman city of Chester is a wonderful place to visit, and leads to the fascinating Boat Museum at Ellesmere Port. These are out-and-back return routes, which allow you to choose your own pace, but if you feel a little more energetic we can suggest some ‘rings’, where you travel round a circular route to arrive back with us: the Cheshire Ring or the Four Counties Ring. Each canal has an individual character, as they were built at different times by different engineers, and every one has its own surprises and delights. You are of course free to make your own variations on any of these suggested canal boat holidays, particularly if have more time to explore: there are many guides and maps to help you choose your ideal UK canal holiday route, and we are always happy to offer advice on which boat and which route would suit you best. Please Remember, if you’re planning to spend a day out and about off your boat, please make sure you factor this into your plans when working out the amount of cruising hours required to complete your holiday route. “This was our first narrowboat holiday (Hausboot Urlaub) at all. We were really surprised about the perfect and friendly communication to Andersens. Our boat (Tana Fjord) was in a perfect condition, well maintained and perfectly equipped. When we first saw it, we were really astonished how nice and clean it was outside and inside. We had a huge and well equipped kitchen, with really everything you need. A nice welcome surprise was waiting for us 🙂 everything was totally clean and in new condition. On our arrival we were shown everything we had to know about handling the boat and the locks, so we could start immediately to our lovely one-week holiday. We did the Llangollen Canal (kleinen Flüssen) which is very beautiful in scenery, but quite narrow at the end. So we were glad to be able to start in Middlewich where the canal is wide enough for beginners. When the weather got “British” for 1 day, we could even heat up the boat to make it cosier, while delicious baked potatoes were getting ready in our well-sized gas oven. Enjoy a canal holiday, boating this summer with Andersen Boats. This summer why not enjoy canal holidays, with the amazing places and adventures they have to offer. From cruising around one of the varied and hugely enjoyable Ring Routes or taking in the breath taking sights of one of our other routes such as the Llangollen Route, with its amazing countryside and must be seen views from the Pontcysyllte Aqueduct, awarded World Heritage site status by Unesco in 2009. A hundred and twenty feet above a river, in an iron trough no wider than the width of you boat, crossing the aqueduct is tantamount to flying through mid air! Family canal holidays are fun adventures for all. Our new canal boating England blog! Canal boating holidays with Andersen Boats, a family business for over 40 years. We want you to have an amazing time on a canal adventure… so we offer narrowboat holidays on some of the best canal routes in England and North Wales. We’re not a typical holiday company, selling holidays… we are a family which aims to give you an experience which is different right from the beginning. Over 40 years of experience gained… giving you the best in boats, routes and an experience which is completely different from the everyday world. Middlewich Rose Queen cruising in our Fjord Duchess through Middlewich Big Lock… Canal boating England at it’s best….. It was a great afternoon escorting the Queen 🙂 through the Middlewich FAB festival….